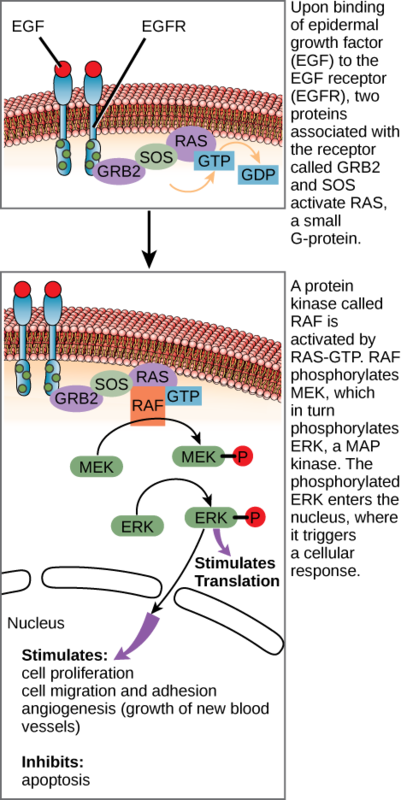 After the ligand binds to the cell-surface receptor, the activation of the receptor’s intracellular components sets off a chain of events that is called a signaling pathway or a signaling cascade. In a signaling pathway, second messengers, enzymes, and activated proteins interact with specific proteins, which are in turn activated in a chain reaction that eventually leads to a change in the cell’s environment ([link]). The events in the cascade occur in a series, much like a current flows in a river. Interactions that occur before a certain point are defined as upstream events, and events after that point are called downstream events. Observe an animation of cell signaling at this site. One of the most common chemical modifications that occurs in signaling pathways is the addition of a phosphate group (PO4–3) to a molecule such as a protein in a process called phosphorylation. The phosphate can be added to a nucleotide such as GMP to form GDP or GTP. 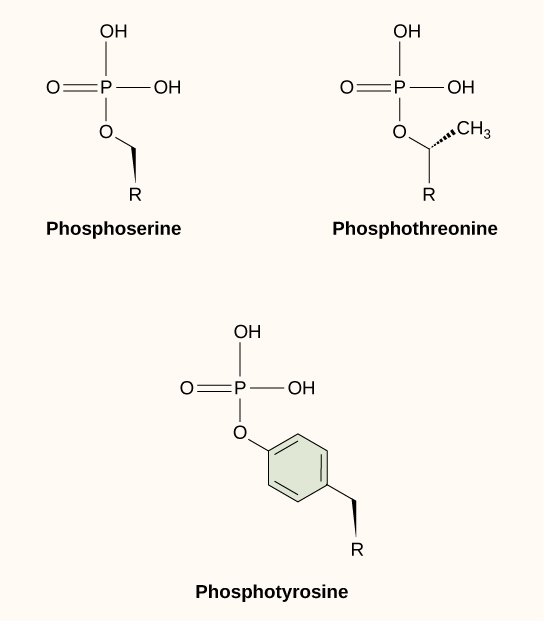 Phosphates are also often added to serine, threonine, and tyrosine residues of proteins, where they replace the hydroxyl group of the amino acid ([link]). The transfer of the phosphate is catalyzed by an enzyme called a kinase. Various kinases are named for the substrate they phosphorylate. Phosphorylation of serine and threonine residues often activates enzymes. Phosphorylation of tyrosine residues can either affect the activity of an enzyme or create a binding site that interacts with downstream components in the signaling cascade. Phosphorylation may activate or inactivate enzymes, and the reversal of phosphorylation, dephosphorylation by a phosphatase, will reverse the effect. Calcium ion is a widely used second messenger. The free concentration of calcium ions (Ca2+) within a cell is very low because ion pumps in the plasma membrane continuously use adenosine-5′-triphosphate (ATP) to remove it. For signaling purposes, Ca2+ is stored in cytoplasmic vesicles, such as the endoplasmic reticulum, or accessed from outside the cell. When signaling occurs, ligand-gated calcium ion channels allow the higher levels of Ca2+ that are present outside the cell (or in intracellular storage compartments) to flow into the cytoplasm, which raises the concentration of cytoplasmic Ca2+. The response to the increase in Ca2+ varies, depending on the cell type involved. For example, in the β-cells of the pancreas, Ca2+ signaling leads to the release of insulin, and in muscle cells, an increase in Ca2+ leads to muscle contractions. Another second messenger utilized in many different cell types is cyclic AMP (cAMP). Cyclic AMP is synthesized by the enzyme adenylyl cyclase from ATP ([link]). The main role of cAMP in cells is to bind to and activate an enzyme called cAMP-dependent kinase (A-kinase). A-kinase regulates many vital metabolic pathways: It phosphorylates serine and threonine residues of its target proteins, activating them in the process. A-kinase is found in many different types of cells, and the target proteins in each kind of cell are different. Differences give rise to the variation of the responses to cAMP in different cells. The enzyme phospholipase C cleaves PIP2 to form diacylglycerol (DAG) and inositol triphosphate (IP3) ([link]). These products of the cleavage of PIP2 serve as second messengers. 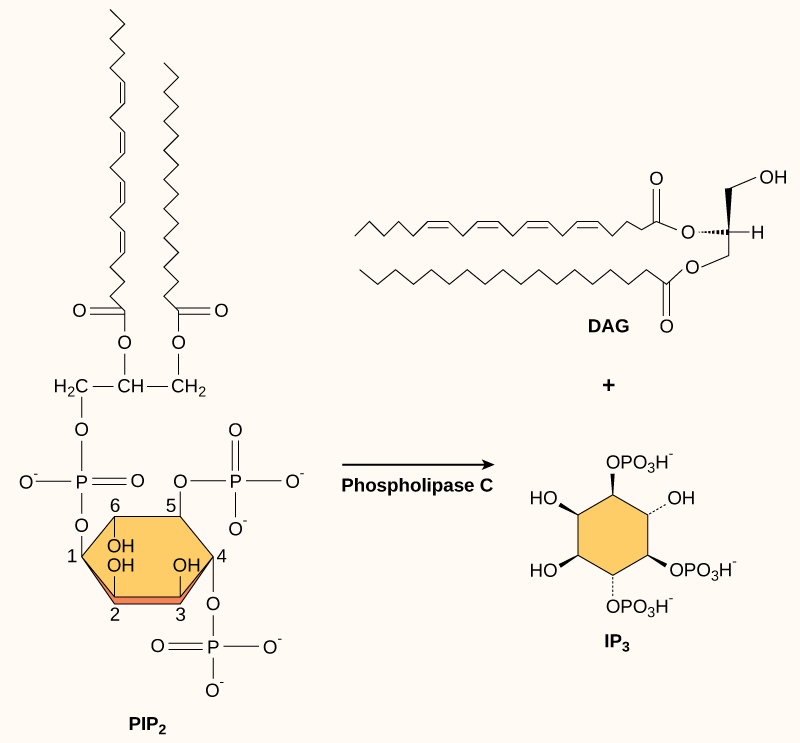 Diacylglycerol (DAG) remains in the plasma membrane and activates protein kinase C (PKC), which then phosphorylates serine and threonine residues in its target proteins. IP3 diffuses into the cytoplasm and binds to ligand-gated calcium channels in the endoplasmic reticulum to release Ca2+ that continues the signal cascade. Ligand binding to the receptor allows for signal transduction through the cell. The chain of events that conveys the signal through the cell is called a signaling pathway or cascade. Signaling pathways are often very complex because of the interplay between different proteins. A major component of cell signaling cascades is the phosphorylation of molecules by enzymes known as kinases. Phosphorylation adds a phosphate group to serine, threonine, and tyrosine residues in a protein, changing their shapes, and activating or inactivating the protein. Small molecules like nucleotides can also be phosphorylated. Second messengers are small, non-protein molecules that are used to transmit a signal within a cell. Some examples of second messengers are calcium ions (Ca2+), cyclic AMP (cAMP), diacylglycerol (DAG), and inositol triphosphate (IP3). [link] In certain cancers, the GTPase activity of the RAS G-protein is inhibited. This means that the RAS protein can no longer hydrolyze GTP into GDP. What effect would this have on downstream cellular events? [link] ERK would become permanently activated, resulting in cell proliferation, migration, adhesion, and the growth of new blood vessels. Apoptosis would be inhibited. Where do DAG and IP3 originate? They are formed by phosphorylation of cAMP. They are ligands expressed by signaling cells. They are hormones that diffuse through the plasma membrane to stimulate protein production. They are the cleavage products of the inositol phospholipid, PIP2. What property enables the residues of the amino acids serine, threonine, and tyrosine to be phosphorylated? They contain a hydroxyl group. They occur more frequently in the amino acid sequence of signaling proteins. What would happen if the intracellular domain of a cell-surface receptor was switched with the domain from another receptor? The binding of the ligand to the extracellular domain would activate the pathway normally activated by the receptor donating the intracellular domain. 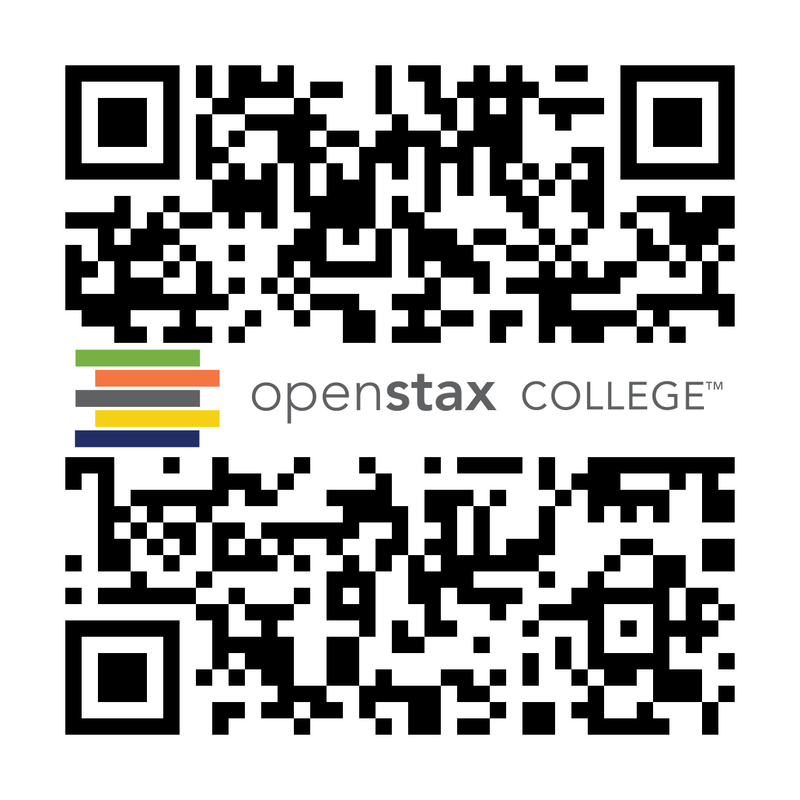 Propagation of the Signal by OpenStaxCollege is licensed under a Creative Commons Attribution 4.0 International License, except where otherwise noted.